So, the writing is going gooood. Got a big chunk written towards the end, and I’m writing a stack of dialogue, so guess what? “Is this a good example of Dialogue, D.R?” he enquired snidely. Where was I and what was I doing… Ah! Blog post. So I’ve also been working a lot on short stories. I will have a new one to post on here tomorrow for Chuck Wendig’s weekly writing challenge, this time about ACTION! 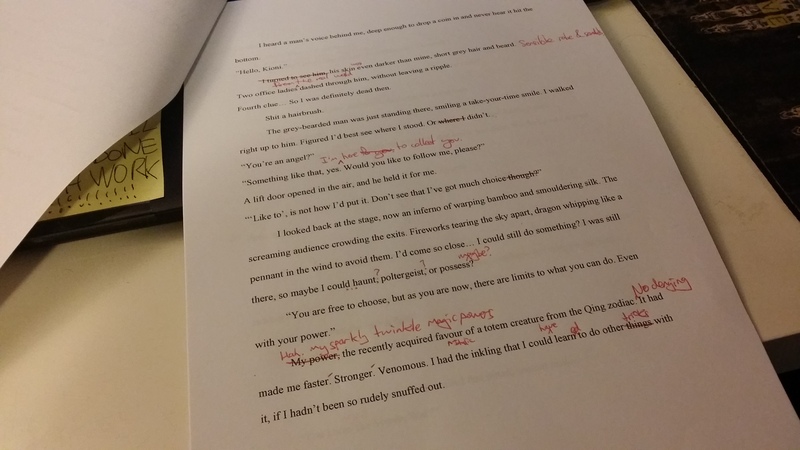 (how appropriate, given last week’s posts), and I’ve been working a fair bit on editing and revising one that I wrote a while back, the second story here. I even did a bit of printing out and attacking with red pen, which is great for spotting things you’re not happy with in a piece. I need to do more revision on these shorts, but it’s fun stuff. Written any short stories lately? Do you struggle to get under the word counts? This entry was posted in Writing and tagged Action, Action Scenes, Chuck Wendig, dialogue, editing, fiction, short stories, Writing. Bookmark the permalink. I haven’t written any short stories lately, but I’m wondering if writing a short story for difficult scenes can help you work through writer’s block. I’ll have to try that out. Thanks for the inspiration, D.R! Sounds like a solid plan to me. Give it a shot! Would be great to read a short story written by you, as I think all I’ve seen so far are some rad webcomics? Yeah, I saw Chuck Wending’s flash fiction challenge about action. It’s too much for me XD Maybe I’ll try the next challenge 🙂 I’m going through a second revision of the suicide story I wrote. It will probably need a third, maybe a fourth. It helped posting it on Critique Circle because I knew it was a bit of a mess, but I didn’t know exactly what was wrong. I’ve actually been reading through many of the critiques at Critique Circle and it has given me a better idea of what works and what doesn’t. Thank you! Great to hear that the critique circle is working out for you. I’m pretty sure if you keep plugging away at it there’s the bones of a really good story in there. Chuck’s challenges vary a lot in intensity, and this time was a LOT harder than the last one I did. Action from start-to-finish?! No slow bits? And it still needs a proper story structure? Ouch. Took all of last night on it. I love these short stories…and i write dialogues storie,i want to know how do i get an editor and to publish them! Thank you! As a beginner your best bet is to join a writing group or workshop. If you’re getting serious, hire a freelance editor. If you’re really, really sure that you’re ready, you can try contacting literary agents, get representation, and find an editor that way. Haha eeexcellent. Thank you! I should have this post done by tonight.